A look at the documentation features in the new, Mark 24, release of the NAG Toolbox for MATLAB®. 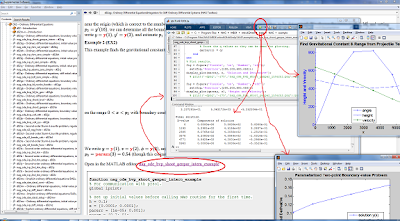 Recent versions of MATLAB have a new documentation system known as the Help Center. This, however is restricted to products from MathWorks; third party extension toolboxes such as our NAG Toolbox for MATLAB® are now documented in a separate help application for Supplemental Software. This has necessitated changes in the way the NAG Toolbox documentation is packaged and installed, and we have taken the opportunity to update the system generally. This post explores some of the new features. Previous releases of the Toolbox have, by default, installed in the toolbox directory of the MATLAB installation on the user's machine. Due to changes in the MATLAB system this does not work for releases after R2012a. So by default the new Mark 24 release of the NAG Toolbox installs under a top level NAG directory in a similar location to our other Library products. The location may be changed as an option on installation, any location may be used that is not in the MATLAB tree. Note that this documentation takes up considerably more space than the previous version as previously it was distributed as a jar file (which is a zip compressed archive) but MATLAB no longer supports jar archive help files. ẑk = 1/(sqrt(n)) ∑ xj × exp( − i(2πjk)/n), k = 0,1, … ,n − 1. While the old rendering was legible, hopefully most people will find the new rendering a great improvement, especially if there are nested superscripts and square roots etc. The new documents in fact contain both sets of markup, defaulting to the old one, and the new MathJax/SVG rendering is only enabled if a sufficiently new browser is detected. Mainly this will only affect Windows users where Internet Explorer 9 or higher is required for SVG support. Previous releases of the Toolbox have had completely separate documentation for the implementations using 32 or 64 bit integer types. Partly as a result of MathWorks discontinuing support for 32 bit Linux, and partly as the int64 type now admits all the same operations as the int32 type, we have now combined the documentation. There is a link at the top of each page to toggle descriptions between int32, int64 and the nag_int type that works on either platform. This is initially set to int32 or int64 depending on the implementation. Unfortunately testing showed that in some browser configurations the CSS to switch between the types interfered with cutting and pasting the example code so in this release the link does not affect the examples which are always int32 or int64 depending on the implementation. Note the displayed results are always from the 64 bit Linux implementation. In previous releases, the example programs for each routine have only been available as part of the documentation. For simple examples they could be cut and pasted directly into the MATLAB command window, however syntactic restrictions on MATLAB function definitions meant that any examples defining functions had to be first copied to a .m file before being executed as you can not define functions at the top level MATLAB command prompt. In this release all example programs are provided as executable .m files as well as appearing in the HTML documentation. They are written to use nag_int so they work in 32 and 64 bit implementations. The most convenient way to access these is a link Open in the MATLAB editor that is just above each example documentation. Clicking on this link (if the MATLAB help or web browser is being used) will open the MATLAB editor, clicking on the green arrow run button will then execute the example in the MATLAB Command Window. 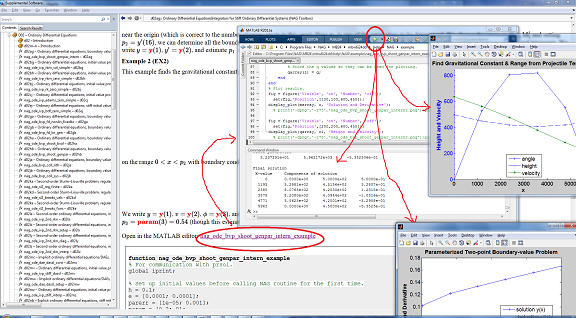 The following screen-shot highlights the process of linking from the documentation in the Supplemental help browser, to the MATLAB editor, to running the program and producing results in the MATLAB Output window and additional MATLAB plots. nag_doc name opens the documentation for the function name in the MATLAB web browser. name may be the long or short name of a function in the NAG Toolbox. If name is omitted, the browser is opened at the start page of the NAG Toolbox documentation. Unfortunately it is not possible to directly open the help browser at a function document, however the web browser offers the same facilities apart from the search facility. If HTML documentation for a command is not found, then the output from the help function is returned. nag_demo uses the standard demo function to open the demo browser for the NAG Toolbox. This also forms a convenient command-line command to open the Supplemental Software Browser as the Demo Browser is the same application and you may navigate from there to the documentation just using the table of contents pane. As previously noted the MATLAB docsearch is no longer available to search the NAG Toolbox documentation. The full text index is still generated and is used by the search box in the Supplemental Software GUI, so this is the fastest way to search the documentation. Unfortunately the Java classes for this search are not exposed by MATLAB so it is not currently possible to make a nag_docsearch command-line version of this. Further documentation is available in the NAG Toolbox help files. The link at the end of the help text of each function uses the nag_doc command described above to show the help in the MATLAB web browser. Small correction: the "looksfor" MATLAB command is actually "lookfor". Very nice work! I would like to see The Mathworks allow 3rd party toolbox authors such as NAG to display their documentation more prominently. I support MATLAB and NAG at The University of Manchester and get a steady stream of queries along the lines of 'Where has the NAG documentation gone'? The Mathworks really need to fix this as its causing problems for a lot of 3rd party toolbox authors.